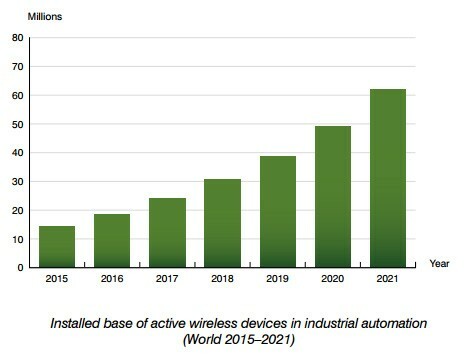 According to a new research report from the M2M/IoT analyst firm Berg Insight, the installed base of wireless IoT devices in industrial automation reached 14.3 million in 2015. The number of wireless IoT devices in automation networks will grow at a compound annual growth rate (CAGR) of 27.7 percent to reach 62.0 million by 2021. There is a wide range of wireless technologies used in industrial automation with different characteristics and use cases. 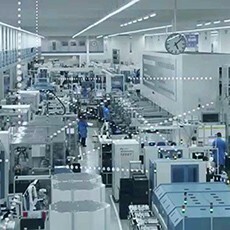 Wi-Fi and Bluetooth are the most widespread technologies in factory automation while cellular connectivity typically is used for remote monitoring and backhaul communication between plants. The increasing popularity of Ethernet based networks in factory automation is one of the key drivers for the popularity of Wi-Fi in such applications. 802.15.4 based standards such as WirelessHART and ISA100.11a are major contenders at the field level in process automation networks. The emerging area of Low Power Wide Area Networking (LPWAN) is a promising alternative in remote monitoring applications. Higher levels of automation and IoT solutions enable shorter lead times, lower inventories, increased throughput as well as more flexibility and the ability to respond faster to changing customer needs. “Connected automation solutions also open up the possibility for entirely new business and service models which can give companies a much needed competitive edge in today’s manufacturing landscape”, concluded Mr. Svanberg.